March 2013 – move out of London to North Norfolk for a life by the sea. April 2013 – set up new business Fabulous Food Finds. June 2014 – buy first house in Sheringham, North Norfolk (how bloody stressful is house buying?! We didn’t even have one to sell!). June 2014 – think there’s something wrong with the water in the new house (I LOVE tea, how could it taste so awful?!). June 2014 – find out there’s nothing wrong with water in new house – it’s a surprise baby in my belly messing with my taste buds! February 2015 – Lottie was born! June 2015 – WHAT?! Can’t be pregnant again can I?! Surely that’s not possible? March 2016 – Alfie was born! April 2016 – poor Alfie not at all well, 5 days of tests at Norfolk and Norwich Hospital then blue lights to Addenbrookes after finding a lump in his bowel. Open bowel surgery a big success… one week of recovery, wait for results of biopsy. May 2016 – 5 weeks after operation discover it was a very rare form of cancer for poor Alfie. Scary times but they think it’s unlikely to recur and so far has not. October 2016 – back to work on BBC Good Food Shows and developing Fabulous Food Finds. I’ll be sharing more about my crazy busy seaside life in upcoming posts which I hope you’ll enjoy! 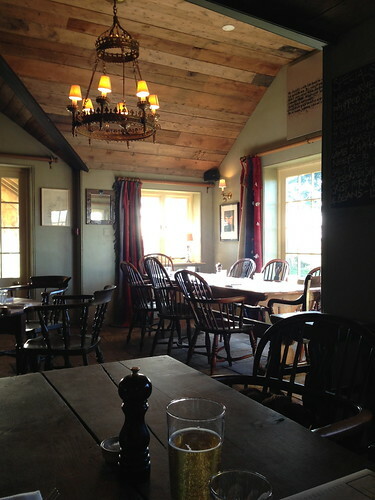 The Gunton Arms is a relatively new addition to the North Norfolk pub scene, having opened in late 2011. I remember when the previously named Elderton Lodge was closed down for refurbishment and the rumours that flew around about what would replace it (a Londoner, an art dealer, someone to do with Mark Hix – I was excited!). I visited last Christmas and had an amazing meal with lots of wine so we booked early for a lunch with friends the weekend after Christmas. I hadn’t realised, but the pub actually won the Michelin guide’s pub of the year for 2012 – excellent news for them, not so great for us having to plan ahead to book a table! The owner is an art dealer, and this is certainly reflected in the interior decorations. I’ve heard that there has been some local controversy over some of the art but I think it adds to the character of the pub, and the experience too. A trip to the ladies toilets will either leave you in the privacy of hyacinths or horses and a bare-chested, and rather overweight lady – choose your cubicle wisely! 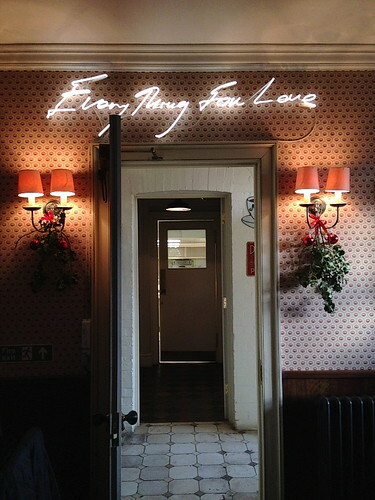 If you are an art lover, you will find a vast range of original pieces including work from Tracey Emin and Damien Hirst. Starters were difficult to choose from, with a great selection. 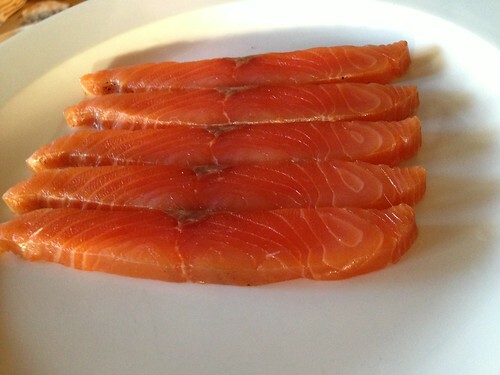 My sister went for their Loch Duart home smoked salmon, which was presented beautifully. It had a perfect texture – soft in the mouth, but still firm and dry. The smoke was strong and unique but didn’t overpower the flavour of the salmon. 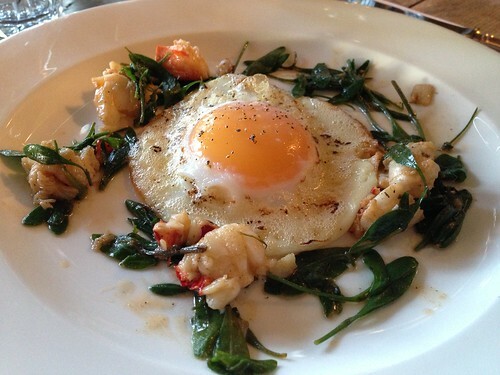 I went for the duck egg with lobster and seashore vegetables, which I loved. When I visited before I had a similar dish but with brown shrimp rather than the lobster, either way, the duck egg yolk acts like a rich, creamy sauce to lubricate the dish and for me was the ultimate seasonal starter. 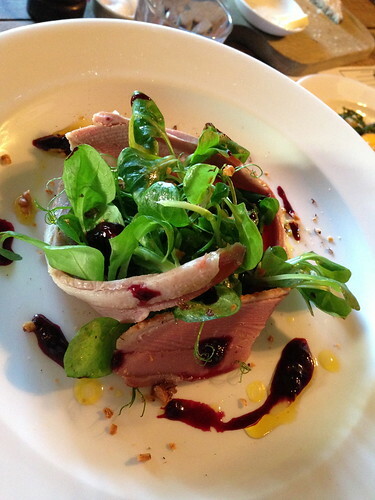 Smoked Gressingham duck with walnut and blackcurrant looked great and was very much enjoyed. 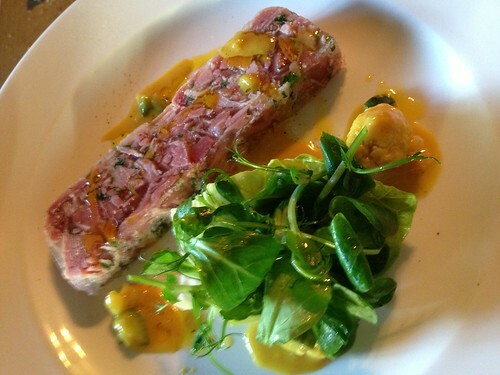 Ham hock terrine was served in a generous portion with home-made piccalilli. 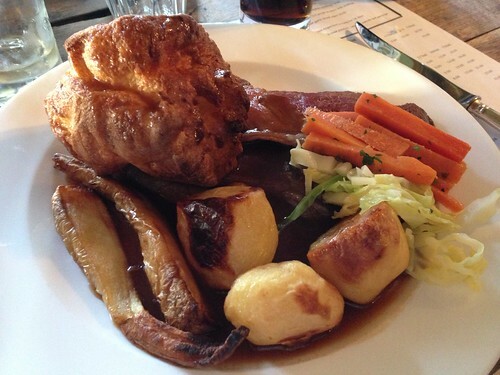 The roast beef was by far the best roast dinner I’d eaten in 2012 – made even better by the intensely rich roast garlic bread sauce (Delia’s bread sauce will never be the same again) which accompanied the chicken but was happily served with the beef too. My boyfriend made the mistake of being lured in by the crispy belly pork with chorizo and chickpea stew on the specials board, and spent the entire meal voicing his dismay at his poor menu choice and accompanying food envy. The beef was cooked just as I wanted, tender and full of flavour, the yorkshire was crispy while retaining a bit of stodge at the bottom, roast potatoes just right, parsnips caramelised to perfection and vegetables lightly buttered and supplied in abundance. Oh and a jug of excellent extra gravy too! We couldn’t resist dessert. 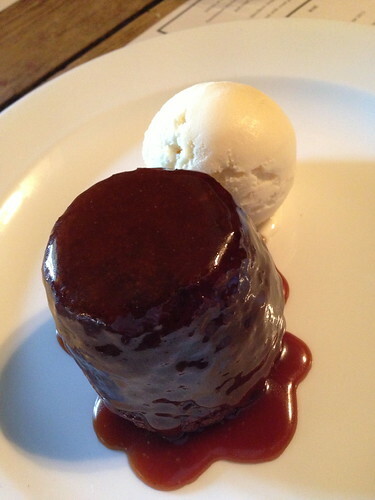 The sticky toffee pudding looked like a work of art and delivered everything you want from this classic dessert, along with a light, milky ice cream to contrast against the sticky, treacley richness. My choice, the Amedei chocolate mousse, was HUGE but great – it was rich while not too bitter, creamy yet still fresh and was the perfect way of showcasing the quality of Tuscan Amedei chocolate. 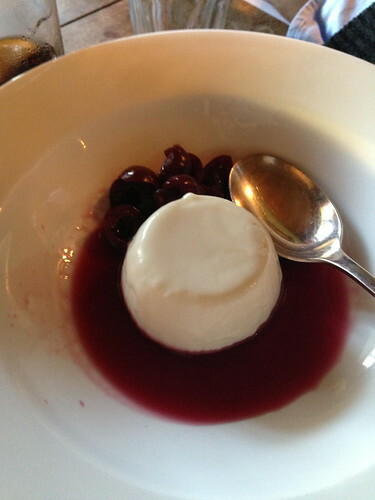 My sister went for the buttermilk pudding with Somerset cherries in eau de vie. The cherries on their own blow your socks off (there were a couple of cherry casualties), but when eaten with the milky pudding they worked in perfect harmony with each other to make a fruity, boozy and creamy pudding. The interior of The Gunton Arms is welcoming, like a home away from home (perhaps without some of the more outrageous art and stuffed animals) and luxuriously furnished with an eclectic mix of solid wood, leather, animal heads and the aforementioned art. 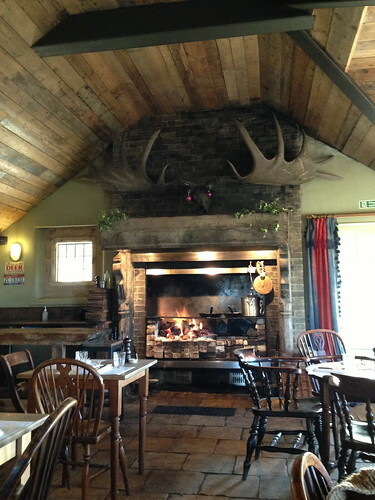 We ate in the ‘grill room’ where a huge fire-place is used to not only warm the room, but also to cook some of the meat based dishes on the menu. 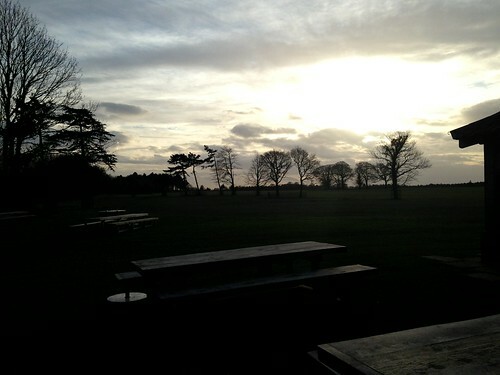 The view from the lodge is incredibly beautiful, with deer scattered across the surrounding fields. 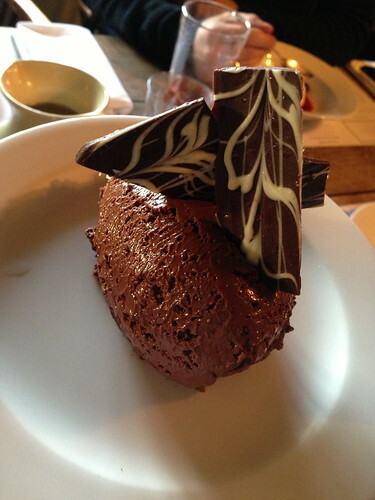 The perfect place to take a long walk in wellies, followed by a well deserved indulgent meal. They have 8 bedrooms, which I’m sure are beautifully decorated, so would be a great place to stay too. The meal wasn’t cheap, at around £40 per head for a 3 course lunch with a couple of drinks each and tip, but with the quality of food and drink, the luxurious and beautiful surroundings and superb service, we were left feeling full, happy and looking forward to returning. They also have a well priced bar menu, with enticing items like red deer dogs and venison sausage rolls – so will definitely be back when next in Norfolk to try some of the bar snacks too! 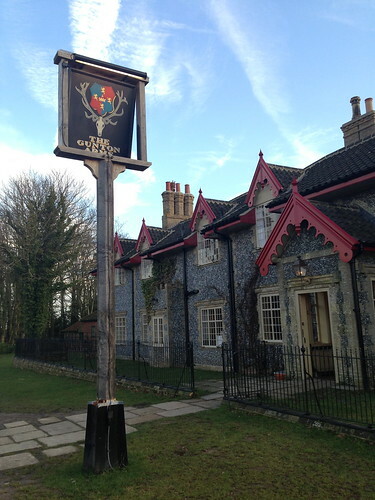 Have you been to The Gunton Arms? If so what did you think? If not, does this post make you want to visit? Last week I made my annual trip back home to North Norfolk for the Cromer Carnival. For a whole week the town celebrates with a parade full of fancy floats, a beer tent, a fancy dress ball, karaoke, bingo, awesome fireworks, street food and we even get a visit from the Red Arrows! Cromer gets pretty busy for the week but it’s definitely worth a visit – my favourite part is sitting in the sunken gardens on the cliff top with cider and hog roast, waiting for the parade to arrive. After the parade we walk up along the cliff top (picture below) to the carnival field, where the beer tent and band awaits!